Welcome to Thea Pitzen, a lawyer, Ombudsman, and military spouse. I’m so thrilled to have this brilliant woman guest posting today for Jo, My Gosh! This is definitely a post that’s relevant for all of my Navy peeps–especially new Navy spouses. To be honest, before Thea wrote this post, I didn’t have much idea of what our Ombudsman was… and now I do. Thanks, Thea, for sharing with us! If you’re a Navy spouse (especially if you’re a new spouse or new to your Command), you may or may not know who your Ombudsman is. Well, that’s the first problem! Luckily, there is a Registry where you can contact your Ombudsman if you don’t already have that information. So, reach out and say hello – we love that! But even if you know who your Ombudsman is, you may or may not think you need their assistance or really know what they do. When I was a new Navy spouse, I found the Ombudsmen to be a wonderful source of support and of cool, calm, rumor-free information, particularly during my husband’s deployments. But, it wasn’t until I became an Ombudsman myself that I realized just how many resources your Navy Ombudsman has to offer! So… what exactly is an Ombudsman? The official role of a Navy Ombudsman is to “serve as an information link between the command leadership and command families,” and Ombudsmen are trained to disseminate information and provide resource referrals. OK, but that sounds pretty vague, right? Now you want to know what kind of information and resource referrals. It turns out, a lot! Some people think of Ombudsmen as being there to respond in times of crisis. It’s true that your Ombudsman can be a great resource during a crisis, but he or she can also help you with lots of other things! For the most part, information you share with your Ombudsman is confidential – with 5 important exceptions. An Ombudsman must report child abuse/neglect, domestic abuse, suspected or potential homicides, suspected or potential suicide risks, and sexual assault. Your Ombudsman can still be a great resource in those cases and can help connect you with counselors, victim’s advocates, medical care and more, but you should know that the Ombudsman must report those events. Other than that, your information will be kept confidential. Now, on to those resources I mentioned! For my first few years as a Navy spouse, my husband and I didn’t have children, and I didn’t spend much time thinking about the educational challenges for military kids. But now that we’re parents, I spend a lot of time thinking about how tough it will be moving every few years to a new school system. But guess what? Your Ombudsman can help! Your Ombudsman can direct you to great resources like the Interstate Compact on Educational Opportunity for Military Children and the School Liaison Officer in your area. In some areas the choices for schools can be overwhelming, but the SLO’s are absolutely amazing at navigating them all! And speaking of when we became parents, that was a stressful time! And so was becoming a military spouse for that matter! The Navy actually provides tons of support for new spouses and parents. But new spouses and new parents are often so preoccupied with, well, adjusting to being a spouse or a parent, that they don’t find out about those resources until long after the fact. If you find yourself struggling with a transition, or even if you’d just like to feel a bit better informed and prepared, ask your Ombudsman what resources are out there! Don’t have kids? Well, maybe you’re looking for a job. Military spouse employment is always a hot topic, as many military spouses face the challenge of trying to maintain a career while moving every few years due to their service member’s career. Your Ombudsman can direct you to all sorts of resources – from obtaining unemployment benefits (did you know many states extend them to military spouses who leave their jobs due to a PCS?) or job training to résumé writing assistance, there is a lot of support out there for job-seeking military spouses. OK, so maybe this Ombudsman is pretty helpful after all, right? What else? Finances. Finances can be a tricky topic for military families – income is often in flux as spouses start, change, and leave jobs, and some financial missteps can impact security clearances and service members’ careers (not to mention your family’s financial stability). So, if you’re having any financial trouble, it’s certainly best to address it before your service member’s Command has to get involved. And even if you’re not having financial trouble, it’s always a good idea to plan ahead and be financially savvy. Your Ombudsman can tell you about resources for budgeting, saving and investment, credit counseling, and more. If you and your family have found yourselves unable to make ends meet, help is out there, and your Ombudsman can direct you to it. Do not hesitate to reach out! To be sure, there are some hats it is not appropriate for an Ombudsman to wear. Your Ombudsman is not there to provide childcare for your children or to offer transportation for people. Your Ombudsman cannot lend you money or provide you with a place to stay in her home. But, your Ombudsman can direct you to resources to find childcare or transportation, to get financial assistance, or to find housing. 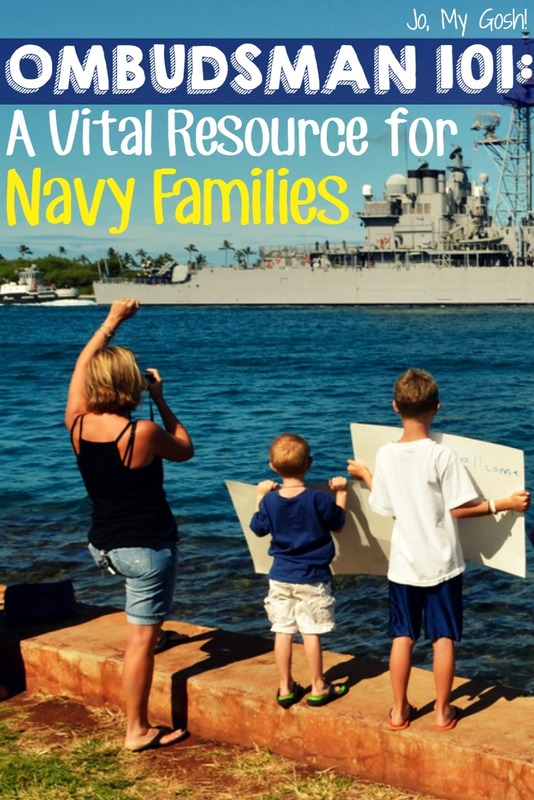 The bottom line is that there are tons of resources out there for our Navy families – so many that most spouses haven’t even heard of many of them, let alone taken advantage of them. It is part of your Ombudsman’s job to know what those resources are, or to find a resource that you need. So, whatever issue you’re facing – whether it’s your marriage or parenting, your finances, education, employment, medical needs, a family emergency, relocating (again), or even just looking for opportunities to volunteer or get more involved in your community – consider reaching out to your Ombudsman! And if you are wondering about something I didn’t mention here, ask. Odds are your Ombudsman will be able to point you in the direction of a helpful resource, and Ombudsmen really do love hearing from and getting to know our Command families. We’re here to serve you. So whatever it is, don’t hesitate to ask. Thea Pitzen is a lawyer and a military spouse who currently spends her days as a sometimes-blogger and full-time mom of an energetic toddler. She also serves on the Board of the Military Spouse JD Network and as a Navy Family Ombudsman. Connect with her on Twitter at @TheaPitzen! Photo: By U.S. Navy photo by Mass Communication Specialist 2nd Class Mark Logico/Released, Modification by Jo, My Gosh! Hello, I am not a military spouse but girlfriend. My boyfriend was deployed last June, his deployment was extended to the end of March. I have never dated anyone in the military so I didn’t know what questions to ask or what information to get from him. He said he would leave it to where I would be notified if anything happened to him. It’s been 9 weeks since I’ve heard anything from him and I’m of course worried. I did email the Ombudsman at Little Creek, VA but no one has responded. What do you recommend for me to do?